Step into this lovely home and you will see how an old worn-down house can be completely transformed into a beautiful new home where Mid-Century meets Traditional. 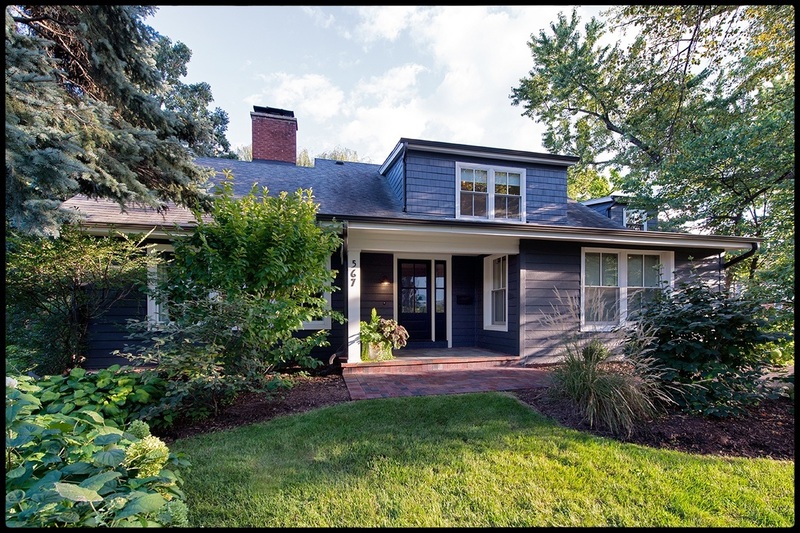 This home, originally built in the 1950s was completely gutted and rehabbed by its current owners, Susan and Jeff Klimala in 2015. As owners of The Kitchen Studio in Glen Ellyn, they have taken their talents beyond the kitchen in redesigning their entire home. Originally a ranch home turned Cape Cod, the Klimalas gutted and reworked the entire layout of the home to work for their family. There are custom built-ins throughout the first floor, as well as a double-sided fireplace between the family room and living room. The home features pops of color from the living room’s peach grass cloth to the purple accents in the family room. The open concept kitchen and dining room allows for more frequent casual family dinners and dinner parties that linger. Originally a 3-season room, the back of the original house was insulated, given vaulted ceilings and skylights and now is the eating area that opens up to the kitchen. The kitchen features a 10-foot island which houses a 5-foot galley sink. The galley sink features two faucets and double-tiered rail system to which accessories such as cutting boards and stainless steel bowls can be added to for cooking. The kitchen also includes mirrored glass pantry doors, a beverage center and a built-in coffee maker. You will find a hidden gem in the second floor. A back room, nicknamed “the library”, was originally an unfinished attic. Because the home was short on closet space, the area became Jack and Jill walk-in closets with a sitting area between them. This home has been designed to be “just right” for the homeowners. It is a comfortable, happy place for them to exist. ​Using every inch of space in an efficient yet fashionable way proves once again that bigger is not always better. 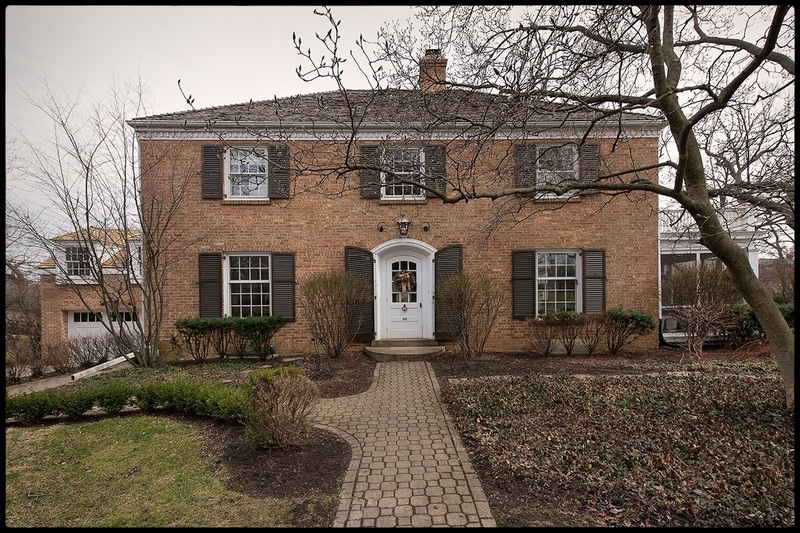 Steps from Lake Ellyn, this brick Colonial Revival with French influences will charm you. Its 2015 renovation was a brainstorm to renovate rather than build new and leave this beloved location. The project came off without a hitch as the homeowners (she the proprietor of Fuchsia Boutique Glen Ellyn & Geneva and he, McJames Construction Glen Ellyn and Chicago) consulted with good friends, architects Liz Poduska and Jim True of truepoduska design before designing and managing the renovation themselves. Find subtle hints as well as bold statements throughout this jewel box. Old school formal rooms have given way for a relaxed, family oriented homestead with the introduction of exposed brick, honed marble, brass and copper details. An unexpected color pallette of Alabaster White combines with Belgian linen upholstery and whitewashed oak flooring for a clean, fresh and new classicism. From its traditional white picket fence, unique interior styling and tranquil patio and courtyard, this house will truly inspire all who visit. ​Blending the splendor of its artistry with its attention to detail, this original plan transcends and pays homage to the interiors of the famous 1908 Gamble House, “Symphony in Wood.” Completed in 2015 by Ray Whalen Builders, Inc., the homeowners’ original design resonates their personal symphony from their collection of Edison phonographs, Mission style furniture, to precision millwork at every turn. Beautiful artwork from around the world and several furniture pieces designed and built by the homeowner, infuses a warm personal touch to the home. 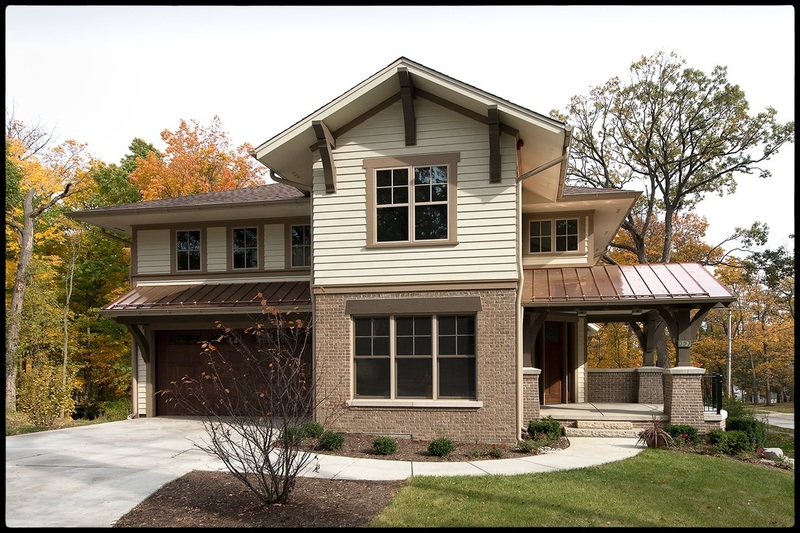 The earthy exterior colors, fortified, tapered stone columns and multiple porches show off the Craftsman style at its best. The interior stays true to many Arts and Crafts characteristics. In designing the home with their architect, Dan Marshall, the homeowners considered innovation, amenity and convenience, but most importantly, family life. The open floor plan creates relaxed living spaces. The charming entryway, the sun-drenched parlor, great room and the stylish kitchen, are perfect for entertaining and special times with family and friends. The cozy loft on the second floor with its inviting fireplace is a great place to snuggle up with a good book or enjoy family board games. Each bedroom boasts a nook / private study, offering everyone space for homework or special projects. This uniquely designed and elegantly crafted masterpiece is definitely home sweet home! 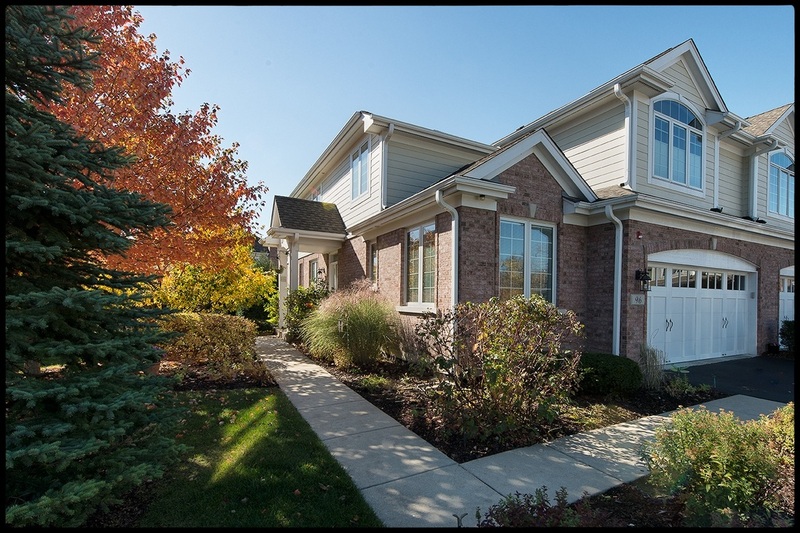 This beautifully constructed Glen Ellyn townhome, built in 2007, respects the harmonious elements of Feng Shui (introduced by the current owners) and the customized elements of the original owner, including personalized California Closets and custom-made cabinetry. Seeking an open space with ample light as a canvas for their collections of artwork, photography and treasured vintage and antique furniture, the owners found the perfect home for their family heirlooms including a turn-of-the-century armoire, an original Gulbransen piano and a vintage Drexel dining set - which speak to their lifetime of traveling and collecting. Anchored by a two-story slate fireplace, this townhome offers a master bedroom and bath on the first floor, with plenty of room for returning children, family and friends. Three floors of ample living area offer this couple room to entertain, relax and uniquely blend the principles of Feng Shui with their personal and meaningful artistic delights. In Feng Shui, love and marriage is enhanced by the use of red and pink tones, flowers, pairs and symbols of love - these elements are artfully arranged in the appropriate spaces to insure a strong and lasting relationship. This refined French country home, richly appointed with superb craftsmanship and architectural detail, also has historical significance. The area's original settler, Moses Stacy, built his family's log cabin on this very site in 1835 (when Glen Ellyn was known as Western Babcock's Grove). Moses and his wife, Joann, operated the famous Stacy's Tavern and stagecoach stop. In 1893, his son, Philo Stacy replaced the log home with a 4500 square foot Queen Anne Victorian mansion that stood in this spot for over 100 years. In 1996, the developer purchased the land and subdivided it, carefully moving the iconic Stacy Mansion to its current location just around the corner. The striking curb appeal and sophisticated landscape design of this half- acre lot welcomes you to this distinguished home built by Gits Home Builders. Upon entering, you are greeted by classic elegance; a two-story grand entrance, exquisite millwork, arched doorways and windows, 9' ceilings and a stunning kitchen by Drury Design with Sub Zero appliances and Calcutta marble. It also boasts 6 spacious bedrooms, 6 luxurious baths, a game room, home theater and fully appointed gym. For the car enthusiast, a heated, five-car garage that sports its own race car! A truly magnificent home that everyone is certain to appreciate.